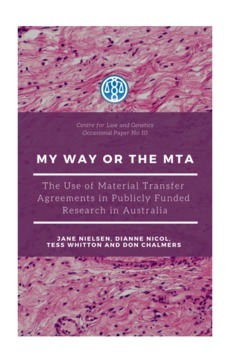 This Occasional Paper is the product of a four-year study investigating the use of material transfer agreements (MTAs) in Australian publiclyfunded, biological research. The study commenced in 2014, and was inspired by similar studies, primarily conducted in overseas jurisdictions, which reported that MTAs have been having detrimental impacts on the progress of research. Our aim was to consider whether similar trends were evident in Australian research, and the implications of these practices on research.